Playing Lego today is different from 10-20 years ago. Not just because I have grown up - there is the net and many websites helping us. www.lego.com is obvious but it lists only sets that one can buy today. What if we would like to know about one from 20 years ago? 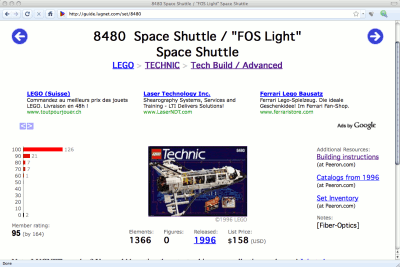 On guide.ludnet.se we can learn that for example the 8480 Space Shuttle set became available in 1996, its price was $158 and contains 1366 bricks. It also gives us links to the building instructions and the set inventory (found on the next site). www.peeron.com is similar. Looking for the shuttle we get the inventory of bricks. The page also returns detailed information about the bricks. For example, clickling on article 2744 "Technic wing back" we can find out what colors was it available in and which sets contained this brick throughout Lego history. On the right hand side we can also find shops that sell this brick - we get back to that below. Following links from Peeron we can also get to www.brickset.com. Instead of raw facts we see reviews and scores. Our favorite shuttle was scored 4.4 points (out of 5). Bricks can be found based on part number like on Peeron, or we can search directly on Peeron and follow the link from there. The latter one is a bit simpler because we see immediately in which country the merchant is located - that may be an important issue influencing our decision. Depending on your country it is generally worthwhile to buy from your own region, let it be the EU, US or Australia. This makes it sure there are no customs fees and the order can be there within 2-4 days. Postage & packaging is usually in the $5...$10 range. Once this is done we can complete the order. 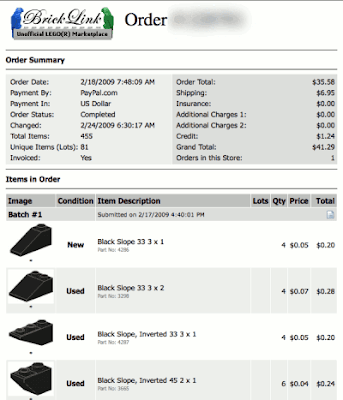 Before getting the invoice the order is open and we can append new batches of items. Getting the real bricks takes 3-4 days after making the payment, depending on your country. I live in Switzerland and have ordered from the UK and France. There were 2-3 day delays but both sellers were very responsive and they reacted quickly and precisely. There are some differences though (besides the colors of course). For example in Betula's design none of the rods are fixed to the hub of the engine. To me this lead to some problems in practice. When changing the direction of the rotation it sometimes got stuck. In my design there is a master cylinder attached to the hub. It rotates very smoothly and does not have a tendency to get stuck. The other change is that instead of using a gear in building the crankshaft I use the normal half-pin shift part even though it means the engine got a bit longer. 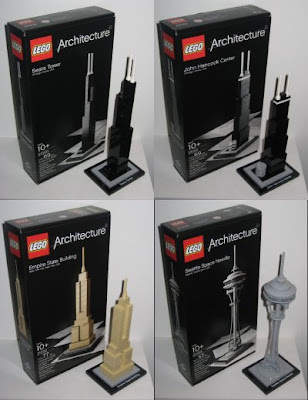 The sets consist of few bricks (57-77 pieces), yet they are recognizable immediately. Less engaged friends sometimes question the meaning of pushing a car to get the pistons moving - in their eyes that's pretty far an "engine". Well, here's something that is surely an engine for them too: the pneumatic engine. The input is compressed air, the output is rotating motion. If you would like to know more, I propose this YouTube channel or the http://www.lpepower.com website with a lot of pictures, video and technical data. There is no detailed description, instead you can buy a complete engine for a somewhat hefty price tag: the inline-3 starts from EUR 130. Throughout the history of Technic there have been always one or more "big cars". These cars represent the top of the range with the most working parts including pistons, gears and others. They are the most wanted sets. Let's have a closer look! The story started in 1977 with the set no. 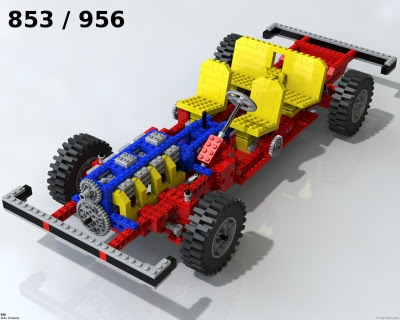 956 (sometimes 853) named "Car Chassis". As the "Technic" brand did not exist yet it ran as part of the brand new "Expert Builder" series. 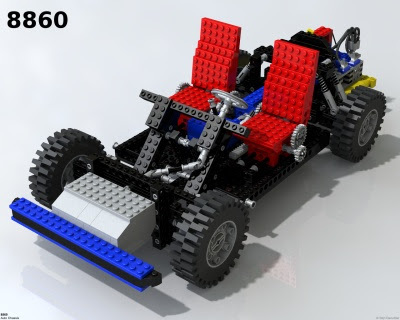 The car introduced many of the Technic parts known today: bricks with holes, connectors, rods, gears. It also had a number of special elements like the pistons (the old 2x2 type). The size made it possible to have a 4-cylinder engine, working steering and gearbox with 2 gears. Four adjustable seats made the set complete. As the name suggests it did not have a chassis and no working suspension either. This set was replaced by the 8860 in 1980. The car became much sportier and was "driven" by a rear-mounted flat-4 engine. Just like its predecessor, it did not have a chassis, but it got a rear differential, a rear suspension and the number of gears has increased to 3. More features took more space as well so it had 2 seats only, but this is perfectly in line with the sporty character. Some models the shock absorber was made of an axle, bushes and connectors. Later models had proper shock absorbers. 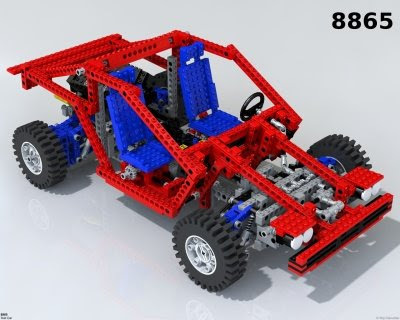 From 1984 the series is called "Technic" officially but the new set 8865 "Test Car" came only in 1988. Unlike the previous sets this one had a Technic-style chassis: edges of the bodywork, the roof and the doors are marked by red bricks. The four-cylinder engine came in a V configuration this time. The newly introduced suspension and steering parts allowed a proper front suspension as well. Apart from that the car was built from the usual studded bricks. 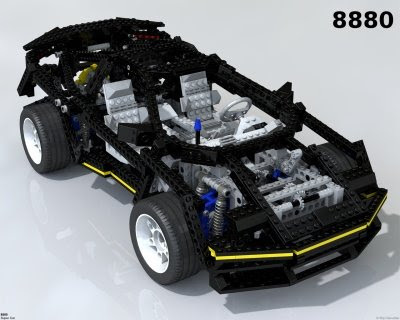 The next set in the line is the 8880 "Super Car" introduced in 1994 that represents the top of traditional Technic building. This is the last car made of mostly studded bricks. It contains new bricks like the V8 engine or the chain in the engine drive. Apart from that it continued the traditions of its ancestors and sports more working features than any of them (and any of its successors). It had a complete four wheel drive with three differentials, plus it included a four wheel steering that is not quite typical on road cars either even today. Of course it did not miss any of the usual ingredients like front and rear suspension and the gearbox with 4 gears. This set is the last in the row that emphasises technical content, for its successors cool looks are more important. It is also the last big car to occupy the top alone, newer models have brothers. Let us talk about them in the next part. Many thanks for the images to koyan@gmx.net, more images here.